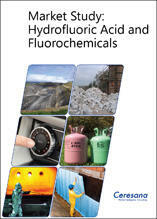 This study on the market for hydrofluoric acid and fluorochemicals is the worldwide first to provide all relevant data, ranging from the production of fluorite to hydrofluoric acid and the demand for fluorochemicals in various applications. This market report also provides details on hydrofluoric acid and fluorochemicals market trends, market size and market growth. Thus Ceresana offers a holistic and transparent overview over current and future developments of the entire value creation chain in this important sector of the chemical industry. In 2021, almost US$5 billion will be generated with the trade of fluorochemicals. Asia-Pacific is projected to account for more than half of global market value. Main raw material in the production of fluorine and other fluorochemicals is the mineral fluorite (CaF2), which is also known as calcium fluoride or fluorspar. More than half of the fluorite mined worldwide comes from China. Other large-scale producers of smelting and acid grade fluorite are Mexico and Mongolia. Acidsparcontains more than 97% calcium fluoride, metspar between 85% and 95%. The acidspar grade fluorite mined in Mexico is mainly exported to the USA for processing, fluorite mined in Mongolia is largely processed in Japan. Whereas the USA can produce small amounts of fluorine as by-product in the production of phosphates, Japan does not possess fluorine bearing rock. Chinese output is predominantly used to satisfy domestic demand and only a small amount is exported. Demand for hydrofluoric acid and fluorochemicals is particularly high in Asia-Pacific. This region's share of global consumption will rise to considerably more than 50% until 2021. China, the largest economic power in this region, will account for the largest share. Japan satisfies demand by a high import quota. The same is the case in the USA that also import large amounts of hydrofluoric acid in addition to fluorite. We expect India to increase demand by more than 5% until 2021. Thus, this country outperforms even the economic power China. However, absolute demand in India continues to be at a much lower level than in China. Among the most important international environmental protection agreements regarding the use of fluorochemicals are the Montreal and Kyoto Protocols. The Montreal Protocol regarding substances degrading the ozone layer has been signed by all UN member states. Binding requirements for the reduction of greenhouse gas emissions as specified in the Kyoto Protocol, on the other hand, are applicable in certain countries only. The largest emitter, the USA, did not ratify the Protocol and no binding emission quotas have been agreed to by China, either. In 2006, the European Union implemented regulation No 842/2006 on certain fluorinated greenhouse gases, which banned additional substances for certain uses. The prohibition of hydrochlorofluorocarbons according to the Montreal Protocol forces manufacturers and consumers to switch to alternatives. Hydrofluorocarbons such as R134a are thus becoming increasingly important. As hydrofluorocarbons, however, act as greenhouse gases, they are to be replaced by other substances on the long term. Derivatives of the hydrofluorocarbon group of elements are hydrofluoric olefins (HFO) that have a lower global warming potential. HFO have not been completely researched yet and are only utilized to a very limited degree so far. Their high flammability is a severe disadvantage. Other alternatives, depending on the application in question, include non-fluoric substances such as carbon dioxide, butane, propane or ammonia. Fluorochemicals such as hydrochlorofluorocarbons and hydrofluorocarbons are mainly used as refrigerants. Demand is increasing in Asia-Pacific in particular, where the general diet is changing due to a rise of prosperity and a higher meat consumption is increasing demand for refrigerators. Also, the number of air conditioners in vehicles and buildings is rising. The dominating application in China, however, remains the production of aluminum. This light metal is predominantly used for transport vehicles. As energy efficiency becomes more and more important in the construction sector, demand for blowing agents in the foaming of plastics such as polyurethane (PUR) and extruded polystyrene foams (XPS), used for building insulation, increases. Demand for fluorochemicals in this segment is likely to increase by almost 5% p.a. until 2021. Chapter 1 covers demand for and production of acid and smelting grade fluorite. A detailed overview is given for individual countries. Also, revenue figures are provided for each region. Analyses cover the years 2005 to 2013 and forecast the 2014 to 2021 period, split by the six world regions Western and Eastern Europe, North and South America, Asia-Pacific, and the Middle East/ Africa. Chapter 2 provides a presentation and analysis of the global market for hydrofluoric acid - including forecasts up to 2021: for the world and each region, demand and revenues will be explained. This chapter also covers various product types such as hydrochlorofluorocarbons, fluorocarbons, fluoropolymers as well as other and inorganic fluorochemicals. Demand for and revenues generated with hydrofluoric acid in the 14 most important countries is analyzed in great detail in chapter 3, as is demand in the applications production of aluminum, refrigerants, blowing agents, and other applications. Chapter 4 offers a substantiated analysis of the application areas for fluorochemicals: Data on demand development, split by the six world regions Western Europe, Eastern Europe, North America, South America, Asia-Pacific, and the Middle East/ Africa is given. Chapter 5 offers a useful directory of the most important producers of fluorochemicals, hydrofluoric acid, and fluorite, clearly arranged according to contact details, turnover, profit, product range, production sites, profile summary, products, and applications. Extensive profiles of the 47 most important manufacturers are provided, e.g. Arkema, Daikin, Dongyue, DuPont, Honeywell, Jiangsu JIN XUE, Juhua Group, Lanxess AG, Mexichem, Sinochem, and Solvay.